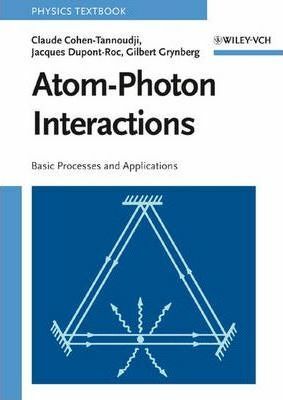 Atom-Photon Interactions: Basic Processes and Applications allows the reader to master various aspects of the physics of the interaction between light and matter. It is devoted to the study of the interactions between photons and atoms in atomic and molecular physics, quantum optics, and laser physics. The elementary processes in which photons are emitted, absorbed, scattered, or exchanged between atoms are treated in detail and described using diagrammatic representation. The book presents different theoretical approaches, including: Perturbative methods The resolvent method Use of the master equation The Langevin equation The optical Bloch equations The dressed-atom approach Each method is presented in a self-contained manner so that it may be studied independently. Many applications of these approaches to simple and important physical phenomena are given to illustrate the potential and limitations of each method. * The dressed-atom approach Each method is presented in a self-contained manner so that it may be studied independently. Many applications of these approaches to simple and important physical phenomena are given to illustrate the potential and limitations of each method. Transition Amplitudes in Electrodynamics. A Survey of Some Interaction Processes Between Photons and Atoms. Nonperturbative Calculation of Transition Amplitudes. Radiation Considered as a Reservoir: Master Equation for the Particles. Optical Bloch Equations. The Dressed Atom Approach. Exercises. Appendix. References. Index. Claude Cohen-Tannoudji is Professor of Physics at the College de France. He is the coauthor of Quantum Mechanics, published by Wiley. Dr. Cohen-Tannoudji is a member of the French Academy of Sciences and a Foreign Associate of the National Academy of Sciences in the United States. He is a corecipient of the 1997 Nobel Prize in physics. Jacques Dupont-Roc holds a full-time research position at CNRS within the Laboratoire Kastler Brossel at the Ecole Normale Superieure. Dr. Dupont-Roc earned his PhD in atomic physics at the University of Paris. Gilbert Grynberg is Professor of Physics at Ecole Polytechnique and maintains a full-time research position at CNRS. Dr. Grynberg earned his PhD in atomic physics at the University of Paris.